Rooibos is a medicinal herb that is native to South Africa’s winter rainfall coastal and mountainous regions with a Mediterranean climate. The needle-like leaves and stem of the plant is traditionally brewed as an herbal tea and is traditionally prepared with lemon and sugar. According to the Live Strong website, rooibos has steadily gained steam among American consumers due to its mild, pleasant flavor, unique aroma, and health benefits. The plant has also gained popularity in other countries. Rooibos is packed with antioxidants that help prevent and slow down the progression of cancer, according to an Annique.com article. 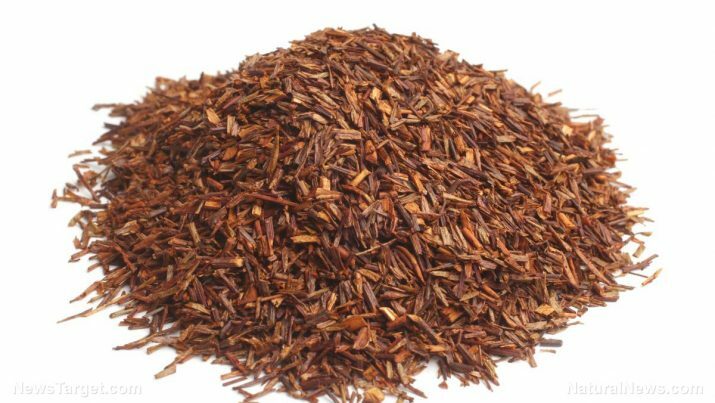 The article notes that rooibos is an excellent source of glutathione that staves off genetic damages and polyphenols that reduce the odds of non-melanoma skin cancers in humans. The plant may also lower the risk of developing liver cancer and kidney damage. A study carried out by a team of researchers at the Cape Peninsula University of Technology in Capetown, South Africa revealed that rooibos lessened the number of lesions and reduced the size of the largest malignant lesion in animal models. Rooibos is also touted for its potential in combating Alzheimer’s disease. According to a study by researchers at the Northeastern Ohio Universities Colleges of Medicine and Pharmacy, the nothofagin compound found in rooibos possesses strong protective effects that promote both nerve and brain function. The plant is found to promote heart health as well. According to a Dove Med entry, the quercetin in rooibos increases good cholesterol levels and counter the harmful effects of free radicals in the body. Likewise, the plant is also valued for its bronchodilating properties that help relieve spasms and reduce blood pressure levels. Previous studies have also shown that the herb is notably effective in improving certain cardiovascular health markers. Patients with diabetes may also greatly benefit from consuming rooibos tea. The plant contains a powerful compound called aspalathin, which promotes healthy blood sugar levels and improves insulin resistance. The substance is also found to boost insulin secretion in the pancreas and enhance glucose absorption by the muscles. The plant is touted to address various digestive issues too. These conditions include stomach cramps, infant colic, and hyperacidity as well as stomach cramps, diarrhea, and heartburn. Rooibos also boasts potent anti-inflammatory properties that fend off allergies such as hay fever and bronchitis. The plant may also address skin conditions such as eczema, acne, and sunburns. The herb also promotes liver health and addresses kidney stones. Rooibos is particularly beneficial in maintaining the brain and heart health. Likewise, the plant is found to improve the body’s digestive profile. The herb is also known to promote skin, muscle, liver, and kidney health. Rooibos also boosts the body’s overall immunity against infections. Rooibos is traditionally used as an herbal tea to prevent a plethora of diseases. Likewise, it can also be added to baked desserts and various coolers. The herb can be added to different meat dishes as well. An entry posted on the Joekels Brands website lists many interesting recipes that use rooibos. Rooibos prevents cancer, Alzheimer’s disease, and heart disease. Rooibos staves off diabetes, muscle spasms, and digestive issues. Rooibos keeps hay fever, bronchitis, and skin diseases in check. Rooibos is beneficial to both the heart and the brain. Rooibos supports both the digestive and immune systems. Rooibos promotes skin, muscle, liver, and kidney health.